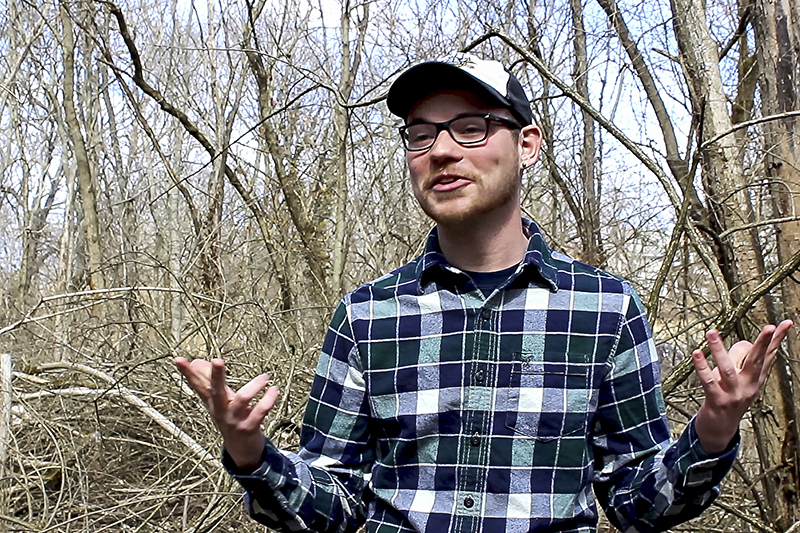 A student’s passion for nature and saving the wilderness recently landed him in the most unlikely of places: the city of Cincinnati’s urban Price Hill neighborhood. 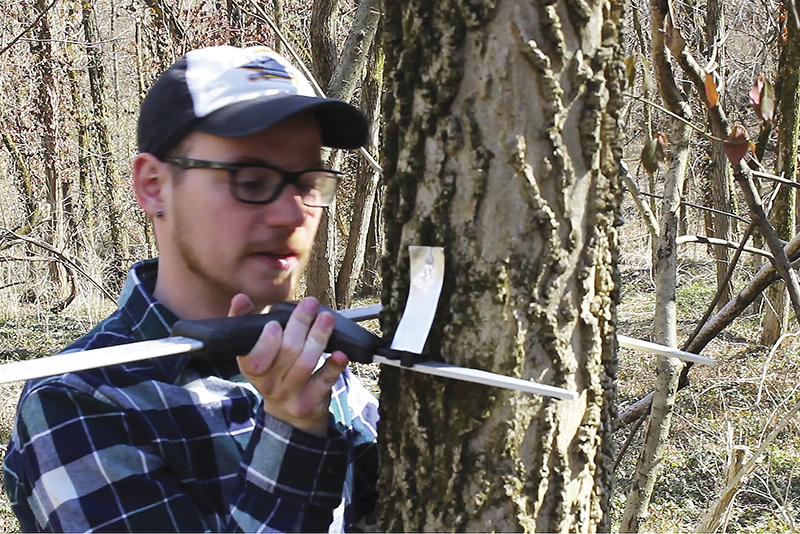 Just across the Ohio River, nestled between bustling streets and historic houses, senior sociology major Luke Freeman’s latest endeavor has him measuring trees and drilling up soil in an area some community members didn’t even know existed. Freeman works at Imago Earth Center,a 36-year-old environmental education organization interested in getting people who live in urban areas to be as sustainable as possible. His mission is to track and reestablish the health of the center’s urban forest, and in turn, help the community surrounding it. This green space and organization is even more vital to the area due to its location just three miles from downtown Cincinnati in a low income neighborhood, according to Clements. The research Freeman is currently working on is called the Permanent Forest Plot Project, which was started to acquire a large set of data about the different forest types in the United States. “So in this forest, an urban forest, we are trying to look at how big the trees are growing in the area, the species compositions, soil characteristics such as PH and organic matter, and moisture to look at the bare minerals they have to work with and grow,” Freeman said. Freeman also uses tools such as calipers to measure and track tree growth. 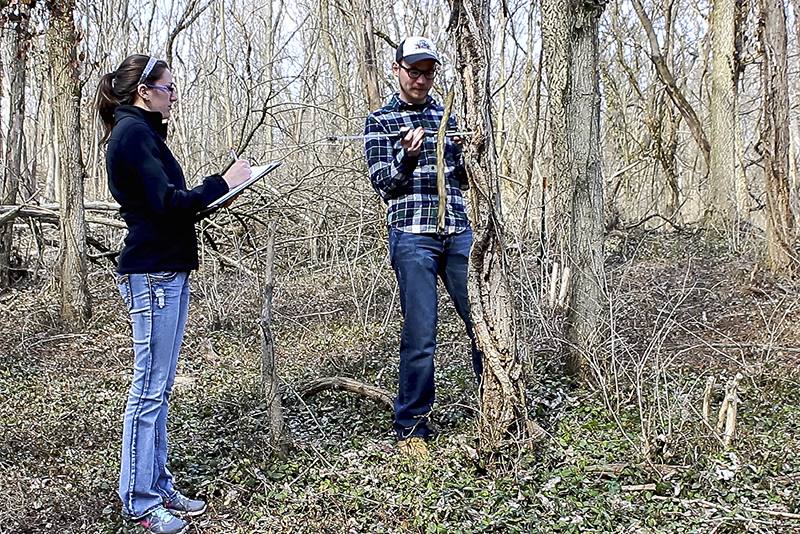 Environmental science major Katie Ollier records data with fellow researcher Freeman. All of these findings can be used to help predict the forest health and ways that may improve it in the future. NKU environmental science major Katie Ollier is also working working on the project. The researchers for this project record all data to an online database, so they will be able to make analyses with the additional information that other people doing similar projects have gathered. Tucked into the corner of Freeman and Ollier’s first plot was an old and decrepit looking tree, so big they had to pull out a measuring tape to collect data instead of using their calipers. Freeman first ventured to Imago for a sociology project to see how the forest area affects the community around it. From there, he tried working with the center in any way he could, eventually getting the opportunity to start working out in the forest. Clements said the effect of this project could be great for the community and that he is really trying to get everyone outdoors and in nature, specifically the area’s youth. Senior sociology major Luke Freeman. Clements said Imago is doing everything from holding workshops for adults, to summer camps for children, to teaching urban community members how to plant and grow their own vegetables indoors. Freeman and Clements hope tracking and assessing the health of the forest will provide the community with a natural place to visit so they can be more in touch with sustainability and nature. While Ollier isn’t from this area, she said the project is still of the utmost importance to her as well. As a sociology major, Freeman stands out due to his dual passion for both the environment and the people within it. He said finding Imago has really been a blessing, and Clements agrees. Freeman uses a caliper to measure a tree in Imago Earth Center’s urban forest. NKU is really looking for these partnerships and really wants their students engaged, according to Clements, who also thinks that Freeman is setting a really good foundation for future students to get involved with this kind of work. Besides his work for Imago, Luke also works for NKU’s Center or Environmental Restoration and is the Campus Recruitment Leader for NKU’s Environmentally Concerned Organization of Students. Freeman plans to graduate in 2014, with hopes to one day work for the US Forest Service, because overall, this kind of work is really what he is passionate about. Senior BFA drawing major Denise Wellbrock refills her water bottle at a filling station in the Student Union. 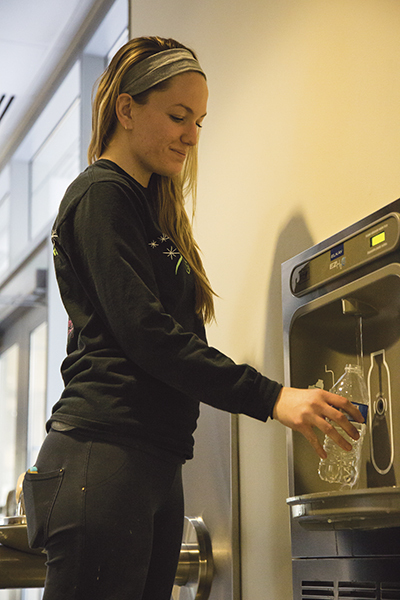 One SGA senator thinks water filling stations such as this could help make NKU a greener campus. The price to retrofit a water station to include one of these water bottle filling purification systems costs around $1,200, according to Blake, with the filters costing $400-$1,600 per station. Blake said these new water bottle filling purification systems will be used on all water fountains that are replaced in the future, as deemed appropriate due to things such as usage and proximity to other fountains. Blake said that each water bottle filling station could save about 13,000-39,000 bottles from being thrown away annually.